1.1 How Nuclear Fission Releases Energy? Nuclear Fission – Nuclear Reactor: Nuclear Reactor Coolant, Moderator, Control Rods Criticality etc. Types of Nuclear Reactors: Light-water reactor (LWR) and Pressurized Heavy-Water Reactor (PHWR) and more. The discovery of nuclear fission began with the discovery of the neutron in 1932 by James Chadwick in England. Nuclear fission of heavy elements was discovered in 1938 by German Otto Hahn and Fritz Strassmann. It was explained theoretically in 1939 by Lise Meitner and Otto Robert Frisch. 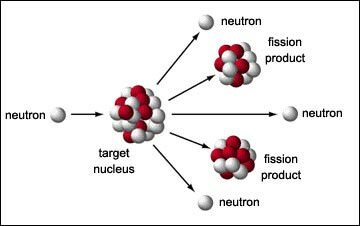 In nuclear physics, nuclear fission is a radioactive decay process in which the nucleus of an atom splits into smaller parts [lighter nuclei]. The fission process often produces free neutrons and gamma photons [gamma rays], and releases a very large amount of energy [exothermic reaction]. [When urea is dissolved in water, the temperature of water solution falls. This reaction is called endothermic reaction]. The nuclear fission process may take place spontaneously in some cases or may be induced by the excitation of the nucleus with a variety of particles (neutrons, protons, deuterons, or alpha particles) or with electromagnetic radiation in the form of gamma rays. In the fission process, radioactive products are formed, and several neutrons are emitted. These neutrons can induce fission in a nearby nucleus of fissionable material and release more neutrons causing a chain reaction. Fissionable material → That can undergo nuclear fission chain reaction. Fissile → That can undergo Controlled or Self-Sustained nuclear fission chain Reaction. If controlled in a nuclear reactor, such a chain reaction can be used to generate power. If uncontrolled [atomic bomb], it can lead to an enormous explosion. Uranium is the most common fissile used in nuclear reactors and nuclear weapons. Uranium isotopes in natural uranium are Uranium-238 or U-238 or 238U (99.27%) and Uranium 235 or U-235 or 235U (0.72%). Uranium-235 can undergo fission when bombarded with slow neutrons only. Uranium-238 can undergo fission when bombarded with fast neutrons only. The nuclei of other heavy elements, such as thorium also fissionable, but with fast neutrons. How Nuclear Fission Releases Energy? Nuclei consist of nucleons [neutrons + protons = mass number]. The actual mass of a nucleus is always less than the sum of the masses of nucleons. This difference is known as the mass defect and is a measure of the total binding energy (and, hence, the stability) of the nucleus. This binding energy is released during the formation of a nucleus. This conversion of mass to energy follows Einstein’s equation, E = mc2, where E is the energy equivalent of a mass, m, and c is the velocity of light. Uranium-235, Plutonium-239 and Thorium-232 are the common fissile material. A slow neutron can be captured by a uranium-235 nucleus. A fast neutron will not be captured, so neutrons must be slowed down by moderation to increase their capture probability in fission reactors. Natural uranium is composed of 0.72% U-235 (the fissionable isotope), 99.27% U-238, and a trace quantity 0.0055% U-234. The 0.72% U-235 is not sufficient to produce a self-sustaining critical chain reaction. For light-water reactors, the fuel must be enriched to 2.5-3.5% U-235. While uranium-235 is the naturally occurring fissionable isotope, Plutonium-239 can be produced by “breeding” it from uranium-238. Uranium-238, which makes up 99.3% of natural uranium, is not fissionable by slow neutrons. U-238 has a small probability for spontaneous fission and also a small probability of fission when bombarded with fast neutrons, but it is not useful as a nuclear fuel source. Thorium-232 is fissionable, so could conceivably be used as a nuclear fuel. The other isotope can undergo fission upon slow-neutron bombardment is uranium-233. Natural uranium is only 0.7% U-235, the fissionable isotope. The other 99.3% is U-238 which is not fissionable. The uranium is usually enriched to 2.5-3.5% U-235 for use in light water reactors. Centrifugal separators and laser enrichment procedures are used in uranium enrichment. The enriched uranium fuel used in fission reactors cannot be used to make a bomb. It takes enrichment to over 90% to obtain the fast chain reaction necessary for weapons applications. Enrichment to 15-30% is typical for breeder reactors. A nuclear reactor is a system that contains and controls sustained nuclear chain reactions. Fuel [Enriched uranium-235 or Plutonium-239] is placed into the reactor vessel along with a small neutron source. The neutrons start a chain reaction where each atom that splits releases more neutrons that cause other atoms to split. Each time an atom splits, it releases large amounts of energy in the form of heat. The heat is carried out of the reactor by coolant, which is most commonly just plain water. The coolant heats up and goes off to a turbine to spin a generator or drive shaft. The coolant is the material that passes through the core, transferring the heat from the fuel to a turbine. It could be water, heavy-water, liquid sodium, helium, or something else. The turbine transfers the heat from the coolant to electricity, just like in a fossil-fuel plant. The containment is the structure made of steel-reinforced concrete that separates the reactor from the environment. Chernobyl did not have a strong containment structure. A nuclear reactor coolant — usually water or molten salt — is circulated past the reactor core to absorb the heat that it generates. The heat is carried away from the reactor and is then used to generate steam. When a large fissile atomic nucleus such as uranium-235 or plutonium-239 absorbs a neutron, it may undergo nuclear fission. The heavy nucleus splits into two or more lighter nuclei, (the fission products), releasing kinetic energy, gamma radiation, and free neutrons. A portion of these neutrons may later be absorbed by other fissile atoms and trigger further fission events, which release more neutrons, and so on. This is known as a nuclear chain reaction. The power output of the reactor is adjusted by controlling how many neutrons are able to create more fissions. Control rods that are made of a neutron poison are used to absorb neutrons. Absorbing more neutrons in a control rod means that there are fewer neutrons available to cause fission. So pushing the control rod deeper into the reactor will reduce its power output, and extracting the control rod will increase it. Control rods are composed of chemical elements such as boron, silver, indium and cadmium. The critical mass of a fissionable material depends upon its nuclear properties, its density, its shape, its enrichment, its purity, its temperature, and its surroundings. Balance of neutrons can be achieved using moderators and control rods. “Subcritical” refers to a system where the loss rate of neutrons is greater than the production rate of neutrons and therefore the neutron population decreases as time goes on. When a reactor is starting up, the neutron population is increased slowly in a controlled manner, so that more neutrons are produced than are lost, and the nuclear reactor becomes supercritical. When the desired power level is achieved, the nuclear reactor is placed into a critical configuration to keep the neutron population and power constant. Finally, during shutdown, the reactor is placed in a subcritical configuration so that the neutron population and power decreases. Supercritical == Car [nuclear reactor] is accelerating. Critical == Car is going at a constant speed. Sub critical == Car is slowing down. A neutron poison (also called a neutron absorber or a nuclear poison) is a substance with a large neutron absorption cross-section, in applications such as nuclear reactors. There are various types of reactors based on moderators, coolants, technologies used. All commercial power reactors are based on nuclear fission. They generally use uranium and its product plutonium as nuclear fuel, though a thorium fuel cycle is also possible. Fission reactors can be divided roughly into two classes, depending on the energy of the neutrons that sustain the fission chain reaction: thermal reactors and fast neutron reactors. Thermal reactors (the most common type of nuclear reactor) use slowed or thermal neutrons to keep up the fission of their fuel. Fast neutron reactors use fast neutrons to cause fission in their fuel. Almost all current reactors are of this type. Comparatively easy to build and operate. Very rare due to complexity and costs. They are more difficult to build and more expensive to operate. These contain neutron moderator materials that slow neutrons. The moderator is often also the coolant, usually water under high pressure. They do not have a neutron moderator, and use less-moderating coolants. High probability of fission due to slow neutrons. 2-5% Enriched fissile is sufficient to sustain a chain reaction. Maintaining a chain reaction requires the fuel to be more highly enriched in fissile material (about 20% or more) due to the relatively lower probability of fission. More radioactive waste Fast reactors have the potential to produce less radioactive waste because all fissile is fissionable with fast neutrons [fuel is highly enriched in fissile material]. Light Water Reactors [LWR] and Hard Water reactors [HWR]. The light-water reactor (LWR) is a type of thermal-neutron reactor that uses NORMAL WATER, as opposed to heavy water, as both its coolant and neutron moderator. Thermal-neutron reactors are the most common type of nuclear reactor, and light-water reactors are the most common type of thermal-neutron reactor. There are three varieties of light-water reactors: the pressurized water reactor (PWR), the boiling water reactor (BWR), and (most designs of) the supercritical water reactor (SCWR). The PWR uses regular water as a coolant. The primary cooling water is kept at very high pressure so it does not boil. Pressurized water reactors (PWRs) constitute the large majority of all Western nuclear power plants. In a PWR, the primary coolant (water) is pumped under high pressure to the reactor core where it is heated by the energy generated by the fission of atoms. The heated water then flows to a steam generator where it transfers its thermal energy to a secondary system where steam is generated and flows to turbines which, in turn, spin an electric generator. In contrast to a boiling water reactor, pressure in the primary coolant loop prevents the water from boiling within the reactor. Very stable due to their tendency to produce less power as temperatures increase. Easier to operate from a stability standpoint. The control rods are held by electromagnets and fall by gravity during power failure. Full insertion safely shuts down the primary nuclear reaction. PWRs are compact reactors that fit well in nuclear submarines and nuclear ships. The coolant water must be highly pressurized to remain liquid at high temperatures. This requires high strength piping and a heavy pressure vessel and hence increases construction costs. The higher pressure can increase the consequences of a loss-of-coolant accident. The high temperature water coolant with boric acid dissolved in it is corrosive to carbon steel (but not stainless steel) and can lead to radiation exposure. It is necessary to enrich [2-5%] the uranium fuel, which significantly increases the costs of fuel production. The requirement to enrich fuel for PWRs also presents a serious proliferation risk. It is the second most common type of electricity-generating nuclear reactor after the pressurized water reactor (PWR). The main difference between a BWR and PWR is that in a BWR, the reactor core heats water, which turns to steam and then drives a steam turbine. In a PWR, the reactor core heats water, which does not boil. This hot water then exchanges heat with a lower pressure water system, which turns to steam and drives the turbine. The reactor vessel and associated components operate at a substantially lower pressure compared to PWR. Pressure vessel is subject to significantly less irradiation compared to a PWR. Operates at a lower nuclear fuel temperature. Fewer components due to no steam generators and no pressurizer vessel. Lower risk (probability) of a rupture causing loss of coolant compared to a PWR. BWRs do not use boric acid to control fission burn-up to avoid the production of tritium leading to less possibility of corrosion within the reactor vessel and piping. BWRs are ideally suited for peaceful uses like power generation, and desalinization, due to low cost, simplicity, and safety focus, which come at the expense of larger size and slightly lower thermal efficiency. BWRs require more complex calculations for managing consumption of nuclear fuel. This also requires more instrumentation in the reactor core. There have been concerns raised about the pressure containment ability after Fukushima I nuclear accidents. Control rods are inserted from below for current BWR designs. In case of power failure, the reactor core can undergo significant damage and turn catastrophic. The supercritical water reactor (SCWR) uses supercritical water as the working fluid. Supercritical water oxidation or SCWO is a process that occurs in water at temperatures and pressures above a mixture’s thermodynamic critical point. Under these conditions water becomes a fluid with unique properties that can be used to advantage in the destruction of hazardous wastes. SCWRs resemble light water reactors (LWRs) but operate at higher pressure and temperature like the pressurized water reactor (PWR) and with a direct once-through cycle like a boiling water reactor (BWR). The SCWR is a promising advanced nuclear system because of its high thermal efficiency and simpler design. It is still in development stage. Supercritical water has excellent heat transfer properties allowing a high power density, a small core, and a small containment structure. As a BWR is simpler than a PWR, a SCWR is a lot simpler and more compact than a less-efficient BWR. There are no steam separators, steam dryers, internal recirculation pumps, or recirculation flow inside the pressure vessel. The stored thermal and radiologic energy in the smaller core would also be less than that of either a BWR’s or a PWR’s. Water is liquid at room temperature, cheap, non-toxic and transparent, simplifying inspection and repair. A fast SCWR could be a breeder reactor, like the proposed Clean And Environmentally Safe Advanced Reactor. A heavy-water SCWR could breed fuel from thorium (4x more abundant than uranium), with increased proliferation resistance over plutonium breeders. Uses heavy water (deuterium oxide D2O) as its coolant and neutron moderator. The heavy water coolant is kept under pressure, allowing it to be heated to higher temperatures without boiling, much as in a pressurized water reactor. While heavy water is significantly more expensive than ordinary light water, it creates greatly enhanced neutron economy, allowing the reactor to operate without fuel-enrichment facilities (offsetting the additional expense of the heavy water) and enhancing the ability of the reactor to make use of alternate fuel cycles. It can be operated without expensive uranium enrichment facilities. The mechanical arrangement places most of the moderator at lower temperatures. The resulting thermal neutrons are “more thermal” making PHWR more efficient. So, PHWR uses fuel more efficiently. Since unenriched uranium fuel accumulates a lower density of fission products than enriched uranium fuel, it generates less heat, allowing more compact storage. The reduced energy content of natural uranium as compared to enriched uranium necessitates more frequent replacement of fuel. The increased rate of fuel movement through the reactor also results in higher volumes of spent fuel than in LWRs employing enriched uranium. Opponents of heavy-water reactors suggest that such reactors pose a much greater risk of nuclear proliferation than comparable light water reactors. Natural Uranium-238 fissile [because enrichment is not required] of a heavy-water reactor is converted into plutonium-239, a fissile material suitable for use in nuclear weapons. As a result, if the fuel of a heavy-water reactor is changed frequently, significant amounts of weapons-grade plutonium can be chemically extracted from the irradiated natural uranium fuel by nuclear reprocessing [Pakistan is pretty good at this]. In this way, the materials necessary to construct a nuclear weapon can be obtained without any uranium enrichment. In addition, the use of heavy water as a moderator results in the production of small amounts of tritium when the deuterium nuclei in the heavy water absorb neutrons. Tritium is essential for the production of boosted fission weapons, which in turn enable the easier production of thermonuclear weapons, including neutron bombs. The proliferation risk of heavy-water reactors was demonstrated when India produced the plutonium for Operation Smiling Buddha, its first nuclear weapon test, by extraction from the spent fuel of a heavy-water research reactor known as the CIRUS reactor [Oh no!!]. References: Mintse, Whatisnuclear.com, Wikipedia etc..